I was making some bread the other day when I noticed that I had half a jar of pest left over in the fridge. It got me thinking about what I could make with it. 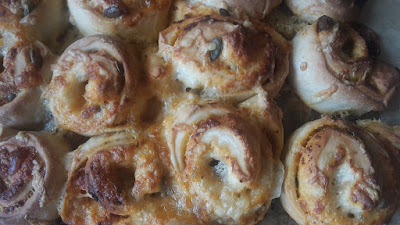 In my mind I had an idea of a kind of savoury Chelsea bun. 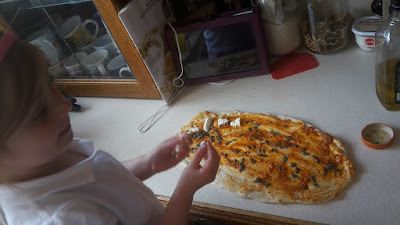 so with my apprentice baker we pulled the dough out into a flat rectangle and then spread the pesto on it, we then scattered pumpkin seeds and broke up a ball of mozzarella over the whole surface. Then, just like you would with a Chelsea bun, we rolled it up and cut it into 12 equal segments, we laid these out on some baking parchment and i grated a bit of cheddar cheese on top. I baked them at around 180 degrees for 20 minutes, until they were cooked through. A really easy bread to make that tastes great. I also love it because once it's made it's a great one to keep in the freezer, then when my wife is off to work she can takes a couple of these for her lunch, there's no need to make sandwiches. Do you make up things that are easy for a packed lunch? I need to borrow your apprentice, she is going to be a great baker with all the learning from you. What a brilliant idea, they look fantastic. Bet they taste lovely. I expect getting kids involved in cooking with you means they're more likely to eat the results. Wow they can go into my lunch box anytime. Sandwiches simply filled with cheddar cheese or sliced fresh meat (ham etc) freeze really well. Wrapped into portions & quickly frozen, they are ready when needed & easily defrost on the way to work. Nothing worse than a pest in the fridge! I'll blame autocorrect for that one! i mean it. or the friendship is over! bahahahah! but no really - send some now. or the friendship is over! bahahaha! They look very yummy. 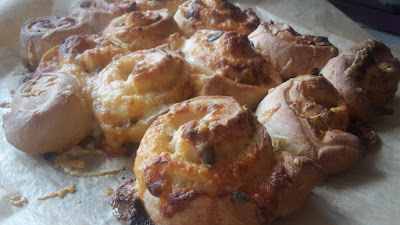 I've made them with chopped up ham and grated cheddar cheese or cream cheese chopped sweet red peppers and onion. All really good, there are probably lots of combinations you can come up with. That sounds really good Kev. We're out of pesto but this is a good reason to put away more this year.